The holidays bring an abundance of joy through family gatherings, gift exchanges and of course sweet treats! This holiday season, remember that people living with Celiac disease or gluten intolerance also like to partake in the sweetness holidays bring. A gluten-free diet is free of all forms of wheat, rye, barley, and some oats. When using oats be sure to select brands labeled “gluten-free”. Appropriate side dishes include potatoes, quinoa and rice. All fruits and vegetables are naturally gluten free so be sure to have an abundance of these available for your guests. In addition, proteins such as meats, poultry, fish, nuts and eggs are also safe for your gluten free guest. Tasty selections for dessert include: candied nuts, baked apples, rice-marshmallow treats, and chocolate covered strawberries. You may also purchase gluten-free cake mix for cupcakes and other cake based desserts! POUR batter into muffin pan, baking cups/liners. 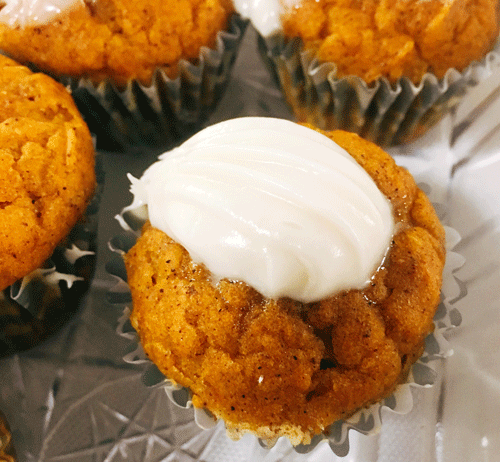 For the frosting, mix the maple syrup into the cream cheese frosting. COOL for 30+ minutes before spreading frosting on cupcakes. Enjoy! *Use any brand of Gluten Free Yellow cake mix available. Rinse the quinoa thoroughly in a fine sieve. Cook the quinoa in pot according to package directions. In a medium roasting pan add the butternut squash, cranberries, onion and garlic. Drizzle with a dash of olive oil, to coat. Add a teaspoon or two of pure maple syrup. Sprinkle with sea salt, ginger and a dash of curry. Toss everything together. Roast in the top half of the oven until the squash is tender, about 15 to 20 minutes. 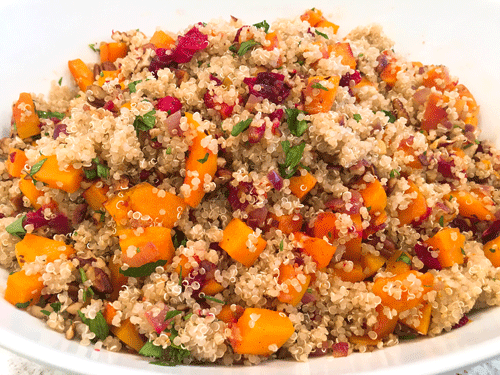 In a large warmed serving bowl, add in the cooked quinoa and the roasted butternut mixture, the toasted pecans, chopped parsley. Taste test and adjust seasoning. Drizzle with extra virgin olive oil and toss to coat. Serve warm.